As the advance of subsidised renewables makes new gas or coal fired power stations ever less economic to build and operate, one of the supposed answers to the artificially created reliability problem is to add batteries to help ‘balance’ the grid. Of course this will also be expensive, and only marginally useful as batteries don’t generate their own power, but that’s just an issue for bill-paying consumers in the privatised UK energy system. A battery installation at a UK biomass power plant is making news this month says TechXplore . Supporters call it an important recognition of the “enormous potential for battery solutions” in the UK. The company is E.ON. The challenge, as they attempt to meet it, is doing their bit to balance the grid. A 10MW lithium-ion battery has been installed and connected to the grid at the Blackburn Meadows biomass plant near Sheffield. The facility is next to an existing power plant, said The Guardian. The E.ON release said the Blackburn Meadows plant is a 30MW renewable energy plant that can produce enough power for around 40,000 homes. 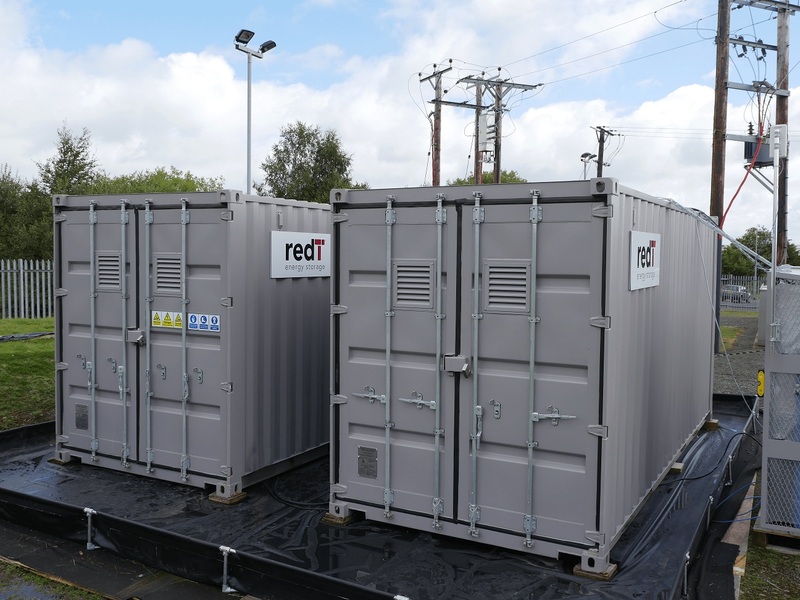 The energy storage project is aimed to help keep power supplies stable, supporting the range of power sources feeding into the UK’s national grid. The Guardian said the facility, run by E.ON, will help the UK grid cope with fast-growing amount of renewable energy. Yes, you may consider this a giant battery. The battery is housed in four 40ft-long shipping containers. E.ON said the battery has the same power as roughly 100 family cars and holds the same amount of energy as 500,000 mobile phone batteries. The Guardian said the Blackburn Meadows battery is one of the biggest in Britain so far. E.ON being economical with the actualité. It’s not renewable generation sources which make the electricity system less stable, it’s the highly intermittents – wind & solar. There are a number of non-island projects ‘sold’ as additional storage that are in fact required for grid stabilisation. Few of the public realise they’re the necessity consequential upon increased penetration of intermittent wind & solar. I love the numbers: 100 family cars can power 40,000 homes. Not only are the consumers are expected to pay double for undependable wind and solar produced electric power, but they are also expected to pay even more for the means to repair the damage done by these conmen to the electrical service. 30 years ago the dependable producers were paid the highest return and undependable producers received the least. A situation now reversed. The wisest solution would be to encourage wind and solar power producers to provide their needed backup to become dependable producers to earn their vaulted position in the modern Ecoloon electrical power supply system…pg. A 10MW battery to do what? It might supply power to the grid for about 40 minutes at the dead of night in late spring or early autumn, mid winter forget it and that is ignoring the conversion losses. Take all the energy the battery will store in its lifetime. Multiply this by the price of electricity. Whatever number you end up with – the battery will cost more. It takes more energy to produce a battery than the battery can store in its lifetime. It is cheaper to simply skip the battery step and use the energy that would have been used to build the battery to power the grid directly. How much of these batteries can be recycled when they reach their use-by-date? October 24 may occur sharp increase in geomagnetic activity. With very low Kp = 2 will jump to the geomagnetic storm (Kp = 5 or Kp=6). Is such a strong magnetic pulse will lead to increased volcanic activity? Like Curious George, I find the numbers a distressing amusement. 100 Cars? Is the “car” a unit of energy or power? Or work? I’m used to solving the “units equation” first, than the actual numbers. I’ve also worked with electricity for about 50 years. So it just shouts at me (in a galling kind of way) to see a battery measured as 10 MW. Are not batteries usually measured in MW-hours or kW-hours? Does this battery produce 10 MW forever? Engineering ought to be left to engineers, not politicians and activists. They don’t want inconvenient facts disturbing the ‘green’ fantasy they’re trying to promote. Being just slightly acquainted with UPS (because this is exactly what is proposed) for short term back up power for data centers, I hate to point a fact that is glossed over. … the inverter system that is required to convert DC (battery) to AC (utility) power consumes a significant amount of power. While this UPS will indeed absorb the excess power produced when it is by a solar panel or wind generator, the power consumption of the inverter EVEN when it is idling (waiting to deliver that power when called upon) is huge. I noticed this when my company had a new UPS installed and was undergoing check outs, the base input (consumption) with Zero KW output was stunning. To give you an analogy of what the problem is here, consider a bus transit system or light rail system for public transport. While during the peak hours where usage is at it’s optimum the efficiency of the system is at its greatest, however, during non peak hours where usage is minimal efficiency is at its worst. The overall efficiency of the mass transit system due to the disparity in loads/usage profile is not impressive at all. Here in lies the problem, IF wind generators only produce electricity 40% of the time “on average” the inverter is consuming power 100% of the time… And its worse for solar panels since they only produce the majority of usable power from 10 am to 2 pm, 4 hours a day. 4/24 = 17% of the time. Equal to 500,000 mobile phone batteries. Capable of delivering 10 MW of power. Batteries can’t cure intermittency. Their introduction into the conversation is fraud. However, their use as reliable sources, as demonstrated here, is a good idea. Except for that pesky cost thing. Renewables producing to batteries, and the grid getting power from the batteries, would go a long way toward providing stable electricity from unstable producers. Think of electromotive train engines, and electric boat submarines. Their engines have no direct connection to the drive train. They generate electricity to batteries, and the batteries power the electric drive train. With the grid operator able to view the status of the batteries power, they can use it with confidence. Of course, wind/solar electricity generation is already prohibitively expensive. Adding the cost of batteries to cure the delivery to the grid is unfeasible, since the whole damn thing is unfeasible. A battery can be used to dump excess power not required by the grid system at the time of generation, assuming obviously that the battery has spare capacity at that time. But this is an expensive way of doing things compared to power stations that can just turn the burners down, so to speak. Would you buy a car if the salesman told you the brakes held an “enormous potential for stopping you”. Yeah 10 MW will last all of 2 seconds. Really not at all expensive either. Only IF the power in and out is DC… Train and submarine motors are DC. The utility grid is AC and therefore MUST be converted to DC to store in the battery and then converted back to AC when needed, all of which requires significant power to accomplish. This is a substantial flaw in current electric power storage schemes which greenies, Musk and others are glossing over. Personally, instead of solar PV panels, I think it would be more efficient and flexible if you used solar thermal to store the heat in molten salt and then use that to create steam for a turbine to create electricity.